It’s very easy to walk in and around Dubrovnik’s Old Town; its size means that you can get from one gate to another, or from one of the entrances to the “edge” of the walls in no time at all! It is, however, the actual exploring of the fascinating Old Town that will keep you more than occupied for a number of days. You will probably enter the Old Town through Pile Gate – in front of you is Stradun. Here you will find the Onofrio Fountain, built in 1438. On the right is the Franciscan Monastery, with one of the oldest functioning pharmacies in Europe, in operation since 1391. At the other end of the Stradun, you will find the locals’ favourite meeting place, the Orlando Column, with the nearby Sponza Place and the baroque Church of St. Blaise. Here also is the Rector’s Palace, built in 1441, which is now a city museum packed with valuable and historic exhibits. Opposite the palace through a narrow street is a square, Gunduliceva Poljana, which is the site of the busy morning market. In the same square is the Jesuit Monastery that is from the early 18th century. From here you can head for the little old town port and visit the city walls which encircle the city and which have been remarkably preserved. Stradun, also called Placa, runs from Pile Gate to Ploce Gate. The paving stones were laid in 1468. At one end (at Pile Gate) is the Onofrio Fountain whilst at the other end is the Orlando Column, a favourite meeting place for locals. The city walls were originally constructed in the 10th century, although fortified considerably in 1453. They are 3m thick along the sea wall, and 6m thick inland. The Old Town has fortresses at its four corners, which are the Minceta Tower, Revelin Fortress, St John’s Fortress, and Bokar Bastion. Constructed in 1522 – a survivor of the 1667 earthquake – the Palace has had a variety of uses over the centuries, including where the Republic of Ragusa minted its currency. These days, it houses the city archives upstairs whilst downstairs is used for exhibitions and during the Summer Festival. It also houses a permanent exhibition named “Memorial Room of the Dubrovnik Defenders”, a memorial to those Dubrovnik citizens who lost their lives during the war between 1991 and 1995. From the 15th and 16th centuries, the western gate was and is the traditional entrance to the Old Town. The gate contains a statue of St Blaise, Dubrovnik’s patron saint. Originally constructed in 1438 by Italian architect Onofrio della Cava, the fountain was partially damaged in the 1667 earthquake and further during the war in 1992 (although it was rapidly restored). 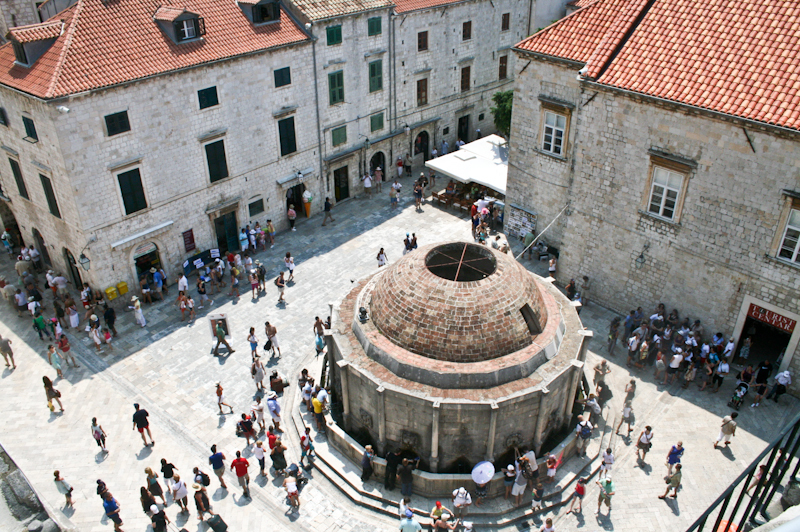 The fountain was part of the city’s water mains constructed in the 15th century which brought water from the Dubrovacka River 12km away. The main part of the monastery was destroyed in the earthquake of 1667 and was rebuilt. The monastery also contains what is thought to be the oldest pharmacy/apothecary in Europe, from 1316/7, and a calming cloister from 1360. A Baroque church, built between 1705 and 1717, which features a silver statue of the Dubrovnik patron saint on the altar, holding a model of the city, which is brought out each year during the Festival of St Blaise. The stained glass windows of the church are relatively recent, having been added in the 1970s. The cathedral currently standing dates from 1673, designed by Roman architect Andrea Buffalini to replace the original 12th century cathedral which was destroyed by the earthquake. The cathedral includes a Assumption Of Our Lady/The Virgin painting/polyptych that has been assumed to have been painted by Titian. The Treasury of the cathedral is home to the skull of St Blaise which has been encased in a jewel-encrusted crown. Another earthquake in 1979 saw cause to dig drains beneath the cathedral; these excavations uncovered a Romanesque cathedral beneath the current one. Further digging, uncovered another church underneath this one, dating from about the 6th century. Mainly designed by Onofrio della Cava – who also designed Onofrio’s fountain – the rector’s palace has a somewhat turbulent history. The original building (from 1200) was completely destroyed in 1435 by a gunpowder explosion; this one, from the same year, saw the second floor also completely destroyed by an other explosion in 1463. Further damage was caused by the 1667 earthquake. The result of all this tumult meant the resulting building is built in various styles and by various designers. Currently home to the city museum, the palace was of course home to the Rector, who acted as a kind of figurehead of the Republic of Ragusa with little actual power. 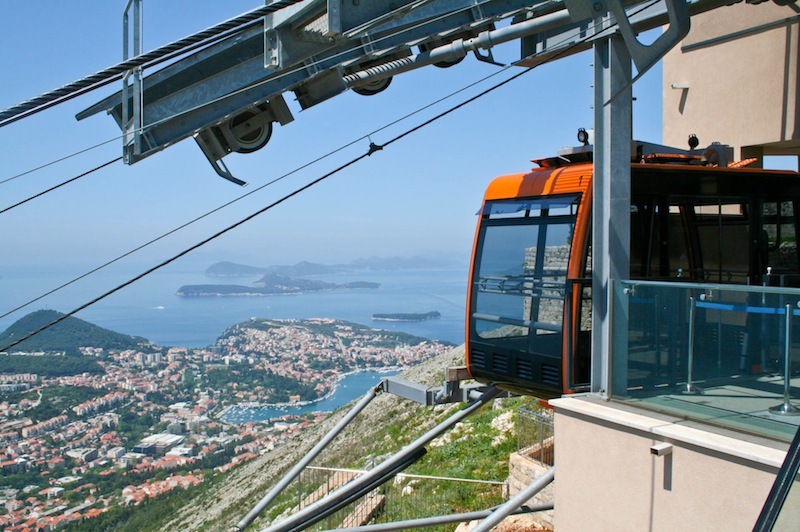 One of Dubrovnik’s famed attractions used to be its cable car – built in 1969 – which rose up to the top of Mount Srd above the city, giving visitors a chance to take in some (even more) spectacular views of the Old Town and the shoreline. Sadly, the cable car was completely destroyed during the war in the early 1990s and was never repaired…until 2010! The service has now been fully restored with entirely new equipment and is now an absolute must for visitors once again. A journey to the top of Mount Srd takes only 3 minutes, and once there you can take in the views whilst enjoy a snack, or something more, at the cafe or restaurant at the top. Also at the top of Mount Srd, and also relatively new, is the Museum of the Croatian War of Independence which, through its various exhibits, shows how Dubrovnik defended itself during the 1991-95 war. The Museum is housed in Fort Imperijal, which was built in the early 19th century when Dubrovnik was controlled by the French (and Napoleon) as a means of defending Dubrovnik. The Fort was in fact little used in this respect until the war in the 1990s and is seen as a symbol of the defence of Dubrovnik during this time. 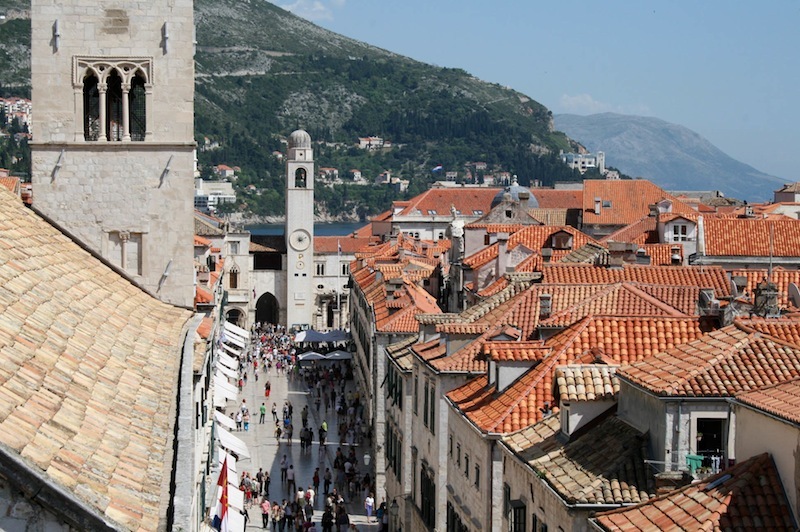 Sightseeing in Dubrovnik Tip – Purchase a Dubrovnik Card! If you’re planning on visiting a number of museums in Dubrovnik, purchasing a Dubrovnik Card is a must. The card gives you entry into many of the city’s museums, as well as allowing you to use the city’s public bus system for free. You can purchase either a one-day card for 130 Kunas, a three-day card for 180 Kunas or a one-week card for 220 Kunas – and there’s even further savings if you pre-order a card online. More info at Dubrovnik Card.